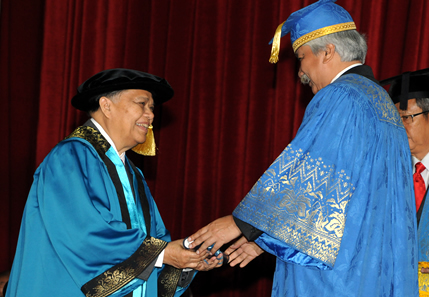 BANGI, 20 Oct, 2012 – A recipient of an Honorary PhD from the National University of Malaysia (UKM) today has advised civil servants to be prepared to give their views and suggestions even if unpalatable to improve government machinery. The former Chairman of the Board of Directors of UKM, Tan Sri Mazlan said they should refrain from complaining too much and be willing to give suggestions on ways to improve the machinery if they are not satisfied with it. He, however, cautioned them to do their homework thoroughly first before making criticismsor claims if they think certain policies or programmes from the ministries are inappropriate. In an interview with UKM News Portal following his conferment of the Hon Doctorate at the first session of the university’s Convocation today, he urged civil servants to give their suggestions in a positive way. They should not also be mere “Yes Men” for fear of reprisals,said the former Director General of the Public Services Department. He said he may write about such things in an autobiography he is planning though he needed to consider their implications before putting them down since they are quite sensitive. Tan Sri Mazlan in his response after being conferred the award by UKM Chancellor,Tuanku Muhriz Ibni Al-Marhum Tuanku Munawirsaid a person needed to have a vision to face the challenges of the world if he wants to achieve something. Life without vision is like a ship drifting in the ocean without a definite destination, he said. 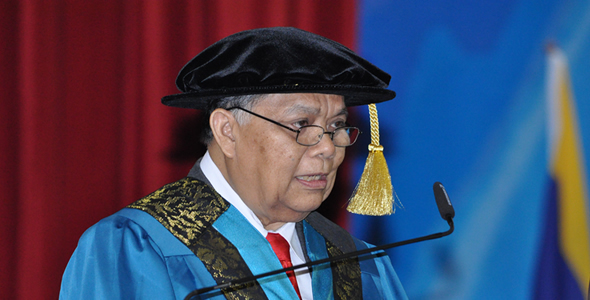 Tan Sri Mazlan served as Chairman of the university’s Board of Directors for four years until May 2011, after an illustrious service with the Government. He saw the university’s elevation to a Research University while also moving towards getting autonomy status during his chairmanship. He had served with distinction in government service in various capacities, including Director-General of the PSD before his retirement in 1998. He began his career in the Administrative and Diplomatic Service in 1966. During the course of his 33 years in Public Service, he had served as INTAN Director, Secretary General of the Ministry of Justice, Secretary General of the Ministry of Information and Mayor of Kuala Lumpur among others. Tan Sri Dr Mazlan graduated with a Bachelor of Arts (Honours) in Historyfrom the University of Malaya, gaining a Masters Degree in Public Administration from the University of Pittsburgh and a PhD in Public Administration from the University of Southern California, Los Angeles.